This page describes the progression of an installation art piece proposed by a few folks in Silicon Valley. The work is part of a series we have done over the last 15 years - all the pieces try and relate aesthetics, math and high tech computing into something that will be of interest. Peter picked up some 1.5" manila rope to make the swings out of. 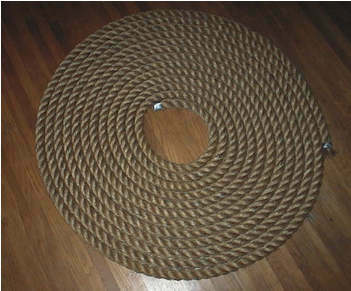 Fun to work with such large rope - has a gentle desire to twist, but doens't seem inclined to kink much. We got a letter from the Emerging Technologies folks saying they would like to show our piece! The two ART Gallery files were submitted to SIGGRAPH via Fed-Ex on February 1st, 2000. Should make the 5pm, February 2nd, 2000 deadline no problem.